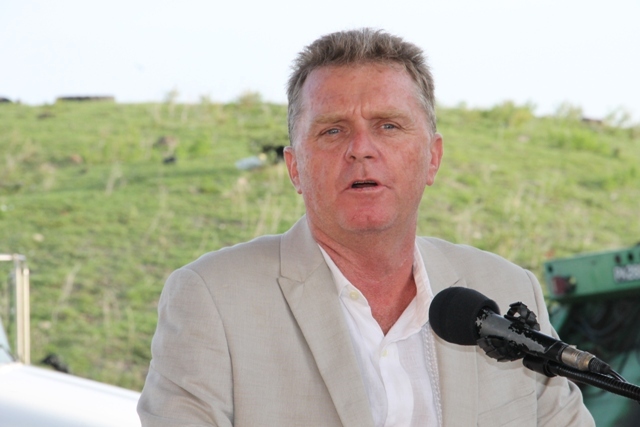 NIA CHARLESTOWN NEVIS (September 21, 2015) — Caribbean Region Operation Manager for US-based Omni Global Steve Hammond says the rest of the world will recognise Nevis for its green environment. He said the joint venture between Omni Global and the Nevis Island Administration (NIA) for a waste-to-energy plant and a solar farm will help the world to do so. 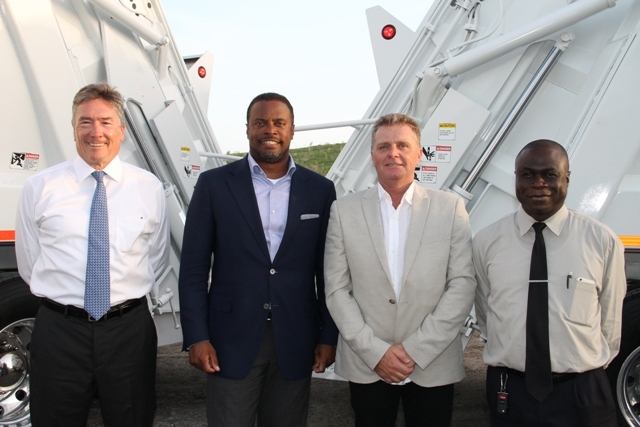 He made the comment when he handed over two new state-of-the-art fully-automated 2016 Kenworth rear end loading garbage collection trucks, as part of the agreement, to the NIA at a ceremony at the Long Point landfill on September 17, 2015. They will be used by the Nevis Solid Waste Management Authority in its day-to-day garbage collection. “I look at the fact that the joint venture will talk louder than my words. In fact, this joint venture will tell the world, not that Nevis is a beautiful place but, Nevis is a leader within the Caribbean of putting the environment right also showing that Nevis is doing the right thing,” he said. According to Hammond, Omni Global’s goal is to offer employment for the people of Nevis and provide a clean environment through the production of electricity without the use of fossil fuels. He said the island’s sunlight and its landfill would form the basis of the project. “In the near future, we as a team, will be working very closely with Mr. [Andrew] Hendrickson and his team [at the Nevis Solid Waste management Authority]. We will be working with them to collect and separate the garbage that will fuel the waste-to-energy [plant]. “We will work with them also to set up a recycling project that will separate those materials that can’t be used for the waste-to-energy and we will prepare it to be loaded and shipped out for processing in a recycling process,” he said. He noted that the two new garbage collection trucks would assist with gathering the garbage generated throughout the island that would be necessary for the success of the project. Hammond also expressed the view that the two trucks are the beginning of great things that the joint venture will achieve.